If you have a graphics card that can handle it, NeverPutt is a neat little mini golf game. This game can be found in the Ubuntu Software Center. Its graphics are far superior than KOLF. Game play is similar to that of KOLF. You are using your mouse to play this game as well. Rotate the angle, adjust the power of the shot and hit the ball. Very simple and fun. 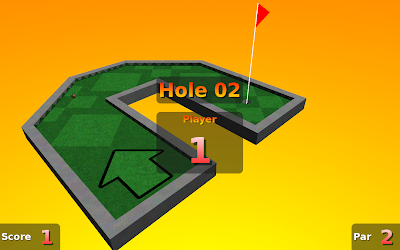 1 to 4 players, 18 holes, awesome engaging music and sound effects. KOLF and NeverPutt are both mini golf games. We’ll cover something a bit better next.